The X188 is a tough hobble strap from Gould & Goodrich. It works to powerfully restrain a suspect in an upright, seated position, allowing easy transportation while preventing running or kicking at doors and windows. The heavy-duty, one inch wide ballistic nylon strap is extremely durable, remaining secure even when used on an aggressive, non-compliant suspect. The material effectively resists abrasion and tearing, retaining its strength over time. 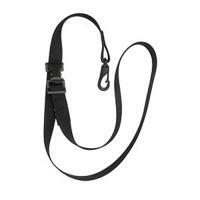 A permanently attached locking alligator clip allows easy adjustment to the strap's length, up to 48 inches. The snap hook at the other end can be attached to handcuffs, or other restraints, as part of a full-body restraining solution. Dimensions (L x W): 48" x 1"
Seems durable and made nice, haven't used them in the field yet. They are just what we needed. they are built good and they now have been given to the Patrol Officers. saves some vehicle windows and keep the arrested individual very restrained.